My father was a carpenter and a cabinetmaker. He could distinguish different species of wood just from the smell and texture of sawdust in the shop or on the jobsite. The most abundant sawdust in his shop (and there was a lot of it) was from white pine. 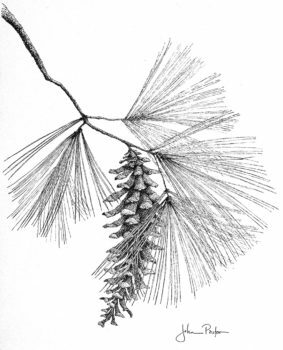 My father carried the resinous scent of white pine sawdust with him. We had white pine furniture in our living room, slept in white pine beds, and folded our clothes into white pine bureaus. After he returned home from World War II, he framed our house with white pine 2 X 4s and paneled the walls in the living and dining rooms with tongue-and-groove knotty pine planks, which he got cheap at the lumberyard because no one else wanted it. In my childhood, these walls were a creamy white with sepia knots where the branches had formerly emerged from the trunks. Over the years, these planks darkened so slowly that I didn’t notice it until I moved away to college and then to grad school and beyond. Each time I came home to visit, I noticed that the panels were slowly and steadily turning the burnt sienna of ripe pumpkins. My father called this type of aged pine “pumpkin pine”. I did my graduate research in an aspen-maple forest on a sandy outwash plain in northern Wisconsin. This forest grew up after Scandinavian loggers, using two-man saws and five-pound double-bit axes, felled the big pines decades before. Once felled and trimmed of their branches, the logs were transported to rivers or lakes by oxen pulling sleds in winters as cold and hard as an iron hammer. When I worked there, I could still find an occasional boot or broken axle spring buried in the forest floor. Stumps of these pines were still scattered everywhere. Their massive sizes – many of them almost four feet in diameter – kindled thoughts of what the previous, primeval forest must have been like. There were several places where the stumps were so close that I could imagine placing my hands on several colossal trunks at once without moving my feet. Even though some of the aspen were as large as 30 inches in diameter and 80 feet tall, it was clear that the current forest was a dwarf compared to the pine forest that had come before. Later, I did get to work in a primeval white pine forest, on Blackhawk Island in the Wisconsin River, almost 200 miles due south from my aspen-maple study forest. This stand was composed of large, old growth white pines sheltering a sugar maple understory. The needles from the pines had accumulated over the centuries and decayed into a black humus that smelled faintly resinous like my father’s workshop. During fall, the sugar maple leaves glowed a scarlet red made even more vivid by their juxtaposition with the deep green pine needles in the overstory. The image of these big white pines over a maple understory in autumn still carries for me the essence of what “forest” means. Still later, colleagues and I were uncovering the history of beaver ponds on the Kabetogama Peninsula in Voyageurs National Park near International Falls, Minnesota, the “Frostbite Falls” of Rocky and Bullwinkle fame. To do this, we were mapping the ponds and the surrounding forests from air photos taken at successively earlier decades in the past back to 1941. The forests, today and in the past, were largely aspen, birch, spruce, and fir, but there were also isolated patches and pockets of white and red pines. There was one especially large patch, about 200 acres, that persisted on all photos from 1941 forward. How old was this stand? We later obtained air photos taken in 1928 by the Royal Canadian Mounted Police as part of the final border survey between Minnesota and Ontario, and the stand was on them, too. But there was something even more interesting. The stand stood on the north shore of a long fjord which had been cut westward into the Kabetogama Peninsula by the great ice sheet 10,000 years ago and which now drained into Lake Kabetogama. To the west of the stand, a fresh harvest scar signaled that the pines there had all been cut. Hundreds, even thousands, of them floated in the fjord, corralled by a chain of logs linked together across the mouth. At that time, there was a sawmill at the eastern tip of the Kabetogama Peninsula and the logs were almost certainly rafted down to it by tugboat. But why were the remaining pines left standing? Most timber companies at the time could see the prairie was not far off to the west and that the vast pineries of the North Woods, through which they logged from Maine to Minnesota, were coming to an end. Logging was done mostly in winter because in spring the Swedes and Finns went home from the bunkhouses to their farms. In many cases, the sizes of the remaining stands were not large enough to set up a logging camp again next winter. So, many logging companies such as Weyerhauser and General Logging closed shop on the white pines and moved out to the Pacific Northwest where they could log the even larger Douglas-fir. Apparently, this white pine stand remained uncut for this reason, abandoned for larger prospects elsewhere. This meant that it might be a primeval white pine stand. At 200 acres, it would be the largest old growth white pine stand in Minnesota outside the Boundary Waters Canoe Area Wilderness to the east. To find out, one day I took our 17-foot aluminum Lund, the standard boat of Minnesota’s 10,000 lakes, and motored an hour or so from our research cabin up Lake Kabetogama to the mouth of the fjord. There, I tied the boat to a cedar along the shore and climbed the bank into the stand. Here were stately white and red pines as far as I could see through the woods. The forest floor was thick and springy with needles, moss, and humus. The lesser rattlesnake plantain orchid (Goodyera repens) dotted the forest floor profusely. The abundance of the orchids and thickness of the forest floor could only mean that this stand had remain undisturbed for at least a century.